The crispiest oven roasted potatoes are a delicious side dish that is ready in 30 minutes! The potatoes are seasoned with simple ingredients yet this is one of the most flavorful potato recipes around! As an Irish girl, I grew up on potatoes with just about every meal! My Granny would boil them which don’t get me wrong, with a little salt, pepper, and butter is delicious! However, a little variety is always good! My Grandfather enjoyed a boiled potato, so, um, boiled potatoes were had by all! I was determined to make potato recipes he’d enjoy in other ways too! These oven roasted potatoes were one of my very early recipes! Even better, my Grandfather loved them so these crispy taters have been a staple for my family! What I love about these crispy potatoes, besides the fact that they taste amazing is that they can pair with so many main dishes! 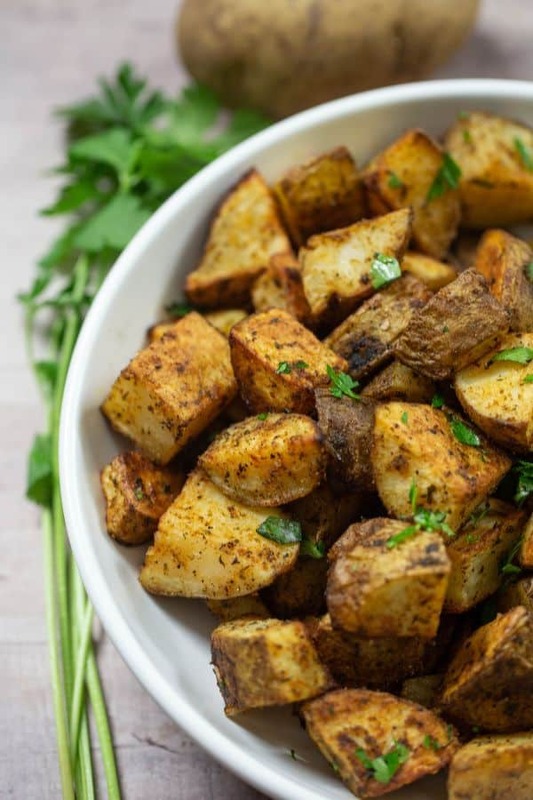 With just a few sprinkling of seasonings and a few hits of olive oil and these potatoes are amazing! 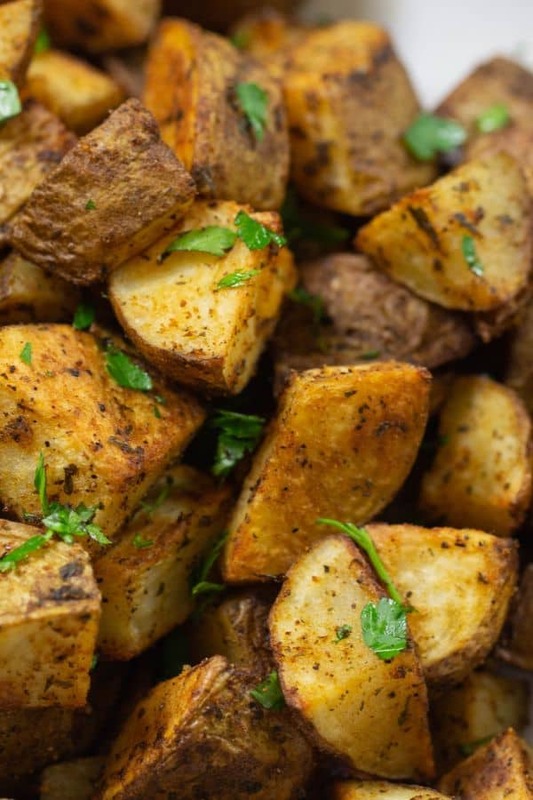 What are the best potatoes to use to make Crispy Oven Roasted Potatoes? My favorite potatoes for roasting are Idaho, Yukon, red, or fingerling potatoes. Can any other oil besides olive oil used for Roasting Potatoes? Sure, I alternate between olive, avocado, grapeseed oil. I have even used coconut oil with this recipe and it’s delicious! What is the best temperature to roast potatoes? A high heat gives a crispy outside and a soft interior for a great potato. I recommend 425-degree oven temperature for roasting potatoes. Can potatoes that are soft and have any green still edible? Unfortunately, if potatoes are soft and are green, throw those potatoes out or place in your compost. What is the best place to store potatoes before using them? Store potatoes in a cool dry place but not in the fridge. A pantry shelf is good. Can other herbs be added used these potatoes? Instant Pot Beer Braised Beef: The entire meal would be ready in less than an hour and so tasty. Grilled Orange Teriyaki Pork Chops: These grilled chops would pair so well with these crispy potatoes. Crispy Baked Drumsticks: Oven baked and super delicious chicken and potatoes, hello delish! Baking Sheets: A must have in every kitchen. These are sturdy and last for years. Smoked Paprika: This is the brand I use and the additional smokey flavor is amazing. Don’t overuse the oil on the potatoes Potatoes won’t be as crispy. Use a roasting pan for the potatoes and don’t overcrowd the pan. Overcrowding can cause the potatoes to not get crispy. Peeling the potatoes is not necessary. Wash the skins well before cutting potatoes. Evenly cut potatoes so they roast at the same rate. Potatoes can be made ahead and reheated at 375 degrees wrapped in aluminum foil. Scrub potatoes and cut into cubes about 2 inches each. Sprinkle the potatoes with olive oil, smoked paprika, onion powder, garlic powder, salt, and pepper. Stir to cover potatoes evenly. Add potatoes to a baking pan sprayed with non-stick spray. Roast at 425 for 20 minutes. Turn potatoes and roast another 10 minutes. 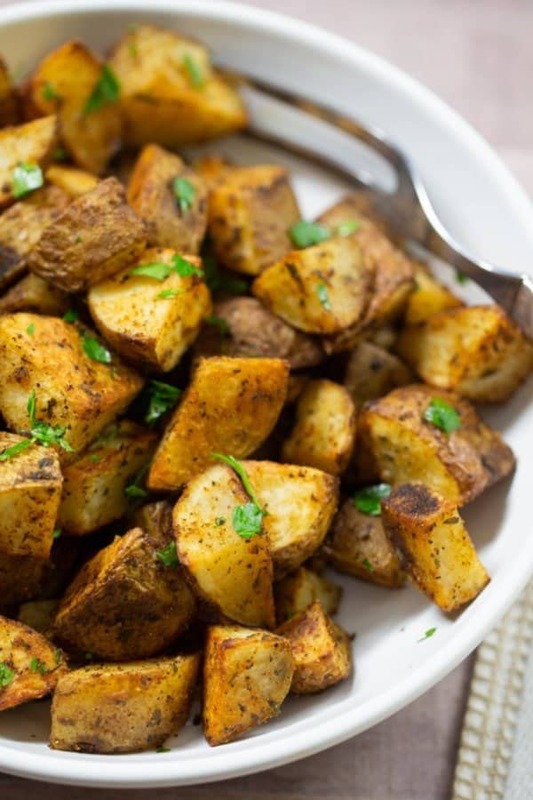 Crispy Roasted Potatoes are the perfect side dish for any meal! An easy side dish with just a few minutes prep time. Simple seasonings and roasting at a high heat give the crispiest roasted potatoes. Preheat oven to 425 degrees. Season a baking sheet with non-stick olive oil spray. Set aside. 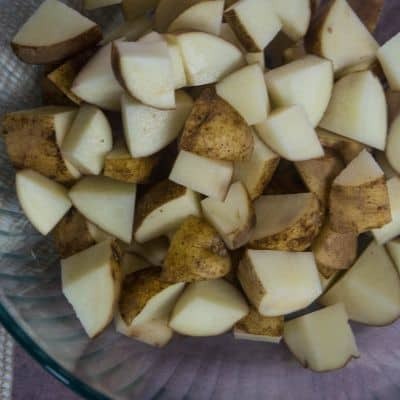 Place washed and cubed potatoes into a bowl. Season with olive oil, smoked paprika, garlic powder, onion powder, salt, black pepper, and parsley. Stir to blend the oil and seasonings onto the potatoes. Place the seasoned potatoes onto the prepared baking sheet. Place on rack in the center of the oven, 20 minutes. After 20 minutes, turn potatoes and place back in the oven for 10 minutes. Remove, let cool slightly and serve with favorite foods. Note 1: Russet, Red, or Yukon potatoes are my preferred potatoes for this recipe. Cut potatoes into even cubes about 2 inches. Note 2: Any oil of choice can be used with these potatoes. Note 3: Smoked paprika adds great flavor if unavailable regular paprika can be used. Note 4: Feel free to vary spices for your potatoes. Thanks go out to Ellen from Family Around the Table and Christie from A Kitchen Hoor’s Adventures for hosting #OurFamilyTable. I love crispy roast potatoes but mine take much longer than yours! I guess I need to cut them into smaller pieces! Going to try your way next time round! Hey Jacqueline, Yes, the cooking time is something I worked on because I wanted these potatoes ready fast! I cut them into 1 inch cubes. They are crispy and tasty! I’m a sucker for crispy potatoes. The seasoning mix on these potatoes sounds delicious. Can’t wait to try these! Thank you so much Lathiya! I agree the smoked paprika adds great flavor to the potatoes! I am a potato fanatic. I could make a meal out of these alone. Perfect for brunch and dinner. You can never have enough great potato recipes. These look delicious. I am so with you Gloria! I could munch on these all day! This recipe has all of the makings of a delicious roasted potato! I love the addition of the paprika – it always adds that little bit of smoke flavour, and helps to achieve that breakfast diner roasted potato colour! These would be great for dinner or breakfast, in my opinion! Thank you so much Byron! yes the smoked paprika is my favorite addition to these potatoes! i love how simple and easy these are. 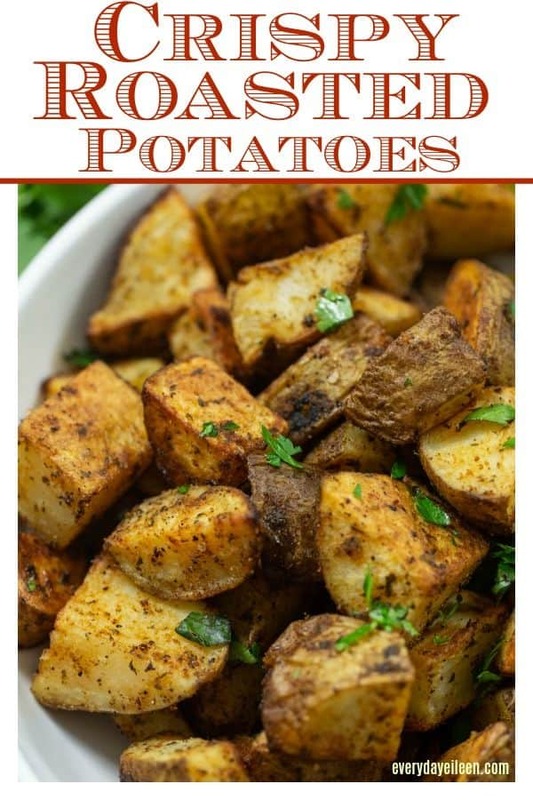 the flavors sound so delicious and who doesn’t love a good crispy roasted potato?? Thank you Danielle, I agree, simple is usually the best! As a Norwegian, I also grew up on potatoes. Often really boring, but also SO AMAZING. And there’s often not much that needs to be done before you reach that amazing level. And this definitely looks easy and super yummy! Aw, thank you Stine! I am so glad you like the potatoes! I love them too! My husband is from Ireland and you can bet he’d love these. Excellent, I am so glad your husband will enjoy the potatoes! I’m a huge potato fan. Roasted potatoes are always in my rotation. Yours look so evenly browned and crispy! Thank you Cindy! I hope you enjoy! Love your seasoning blend! I love to use paprika as well. It gives a wonderful smokey flavor to the potatoes. Thank you so much! I agree paprika is a must add! I”m sure your grandfather loved these. Who could resist?